For almost 30 years, a federally funded program with a long name and lofty goals has been quietly helping talented St. Mary’s University students find their purpose in research careers toward which they might not otherwise have gravitated. 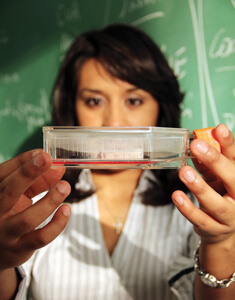 It’s called the Minority Access to Research Careers Undergraduate Student Traning in Academic Research program, and for recent graduates like Chrystal Loya and Perla Rodriguez, and alumni like Vincent Aguirre, M.D., Ph.D., it has been the secret to their success. “The MARC program served an unbelievably important purpose in my life. It is a wonderful opportunity for the students of St. Mary’s and other similar schools to be exposed to the wonders of science—something they might not otherwise be exposed to,” said Aguirre, a San Antonio native who earned a combined M.D. and Ph.D. at Harvard University after graduating from St. Mary’s in 1992. Timothy Raabe, Ph.D., himself a biomedical researcher and professor of biology, directs the St. Mary’s program, known in short as MARC U-STAR. St. Mary’s MARC program is supported with funding from the National Institute of General Medical Sciences, within the National Institutes of Health. For the past 27 years, it has produced dozens of St. Mary’s students who go on to earn doctorates in areas such as biology, chemistry, biochemistry, physics, and engineering science. The federal program was started to encourage minorities to consider educational trajectories toward doctoral science research. Raabe noted that because minorities have traditionally been underrepresented at research institutions, this program looks to help reduce that gap. In the program, faculty works with the students to offer research opportunities, specialized courses, seminars and workshops. While the pre-MARC program targets firstand second-year students, the regular MARC program is for junior- and senior-level undergraduates. The late Jose Miguel Cimadevilla, Ph.D., a long-time St. Mary’s professor, brought MARC to campus in 1983 (and led the program until his death in 2005). Today Raabe continues the work Cimadevilla began, estimating that about half of MARC students will earn doctoral degrees—much greater than the percentage of the regular student population that earns a doctorate. The program works by making early contact with students who might fit the bill for MARC and whetting their appetite for research. Admission to MARC is competitive, with only six slots (three for juniors and three for seniors), making the pre-MARC training program valuable. It gives interested students a preview of what a research career would involve and a leg up in applying for the six coveted spots. Current biology major Chrystal Loya believes her experience in the pre- MARC program made the difference for her. Loya had big dreams long before she ever heard of the MARC program, and she came to St. Mary’s intending to complete her undergraduate degree and then move on to medical school. Graduating this May, Rodriguez plans to work toward a Ph.D. in biomedical science, and has applied to six graduate schools with two interviews already scheduled. The competitive nature of the MARC program is built not only on the unique undergraduate research opportunities, but also on the financial benefits. Participants receive a significant stipend as well as $15,000 a year in tuition, to minimize students’ financial worries so that they can focus on research. 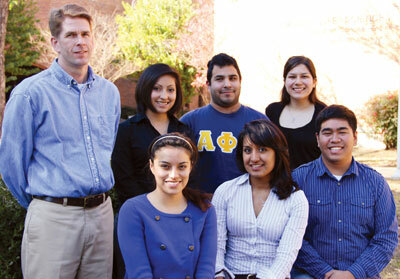 Loya was first attracted to St. Mary’s because of the University’s success in preparing students for medical school. Historically more than half of graduates who apply are admitted to medical and dental schools, well above the national average of 35 percent. Once she realized her true interest was in research, Loya was pleased to find that St. Mary’s offered opportunities like MARC to prepare her for graduate school as well. Winston Erevelles, Ph.D., dean of the St. Mary’s School of Science, Engineering and Technology, recognizes the importance of having rigorous and vibrant programs that attract students to science, technology, engineering, and mathematics (STEM) fields. The research process is valuable on a much larger scale—it causes students to explore, to do scientific inquiry and to further develop the profession and the student. 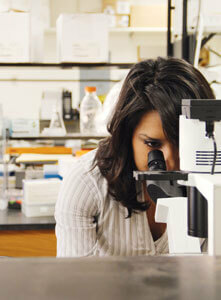 Senior biology major Chrystal Loya is nearing the end of her college career at St. Mary’s University. As an undergraduate, she has had many of the typical educational experiences of any St. Mary’s student. But she’s also had opportunities a bit more out of the ordinary, like picking the brains of fruit fly larvae. That’s right: Loya has basically conducted surgery on a fly larva’s brain. When asked just how one goes about such delicate work, Loya matter-of-factly explained that you need a good microscope and some “really sharp tweezers.” What might seem out of the ordinary to some has been a matter of course for this El Paso native who started in the pre- MARC program the summer after her freshman year, and then moved into the regular MARC program her junior year. With the answer to “how?” out of the way, the next question was “why?” Of course, Loya’s work on fruit flies’ brains was in the name of a good cause. Working with research scientists at the Greehey Children’s Cancer Research Institute at the University of Texas Health Sciences Center at San Antonio, Loya explored a possible cause at the molecular level of brain tumor formation. In this case, the subject was fruit flies. While the work at the Cancer Research Institute continues there, she is now on a new project with Veronica Contreras-Shannon, Ph.D., a St. Mary’s assistant professor of biological sciences, researching the molecular changes brought on by treating schizophrenia. Loya is looking at what anti-psychotic drugs do to muscle cells that might lead to serious side effects for patients. She enjoyed her previous research, and said she was lucky to have had such an advanced opportunity so early in her college career, but she wants to explore many different directions for biochemical research. “I wanted to try something different to see if I am interested in other areas as well,” Loya said. The goal of the MARC program is to prepare students for graduate-level research, and that is just what Loya has been doing for two years now. She started in the cancer research lab doing basic preparation work, but by the end of that first summer, she was on her way with her own research project. She said that without the experience of the MARC program, she likely would not have considered graduate school, since medical school had been her first priority. “Not a lot of people are exposed to this. In high school, they talk a lot about getting you ready for college, but there isn’t much said about getting ready for graduate school.” Loya added. In the MARC program, she has discovered her pathway to success.